It’s sleek, it’s portable, it folds up flat and now it’s available in white! It’s the Handysitt booster seat from Minui, previously only available in black and birch in Australia, but now on our shores in beautiful bright white. The Handysitt seat is a great high chair alternative – it’s lightweight (less than three kilograms), and great looking and if you prefer a full size high chair, it can be connected to the full size Handysitt chair for a stand-alone option. 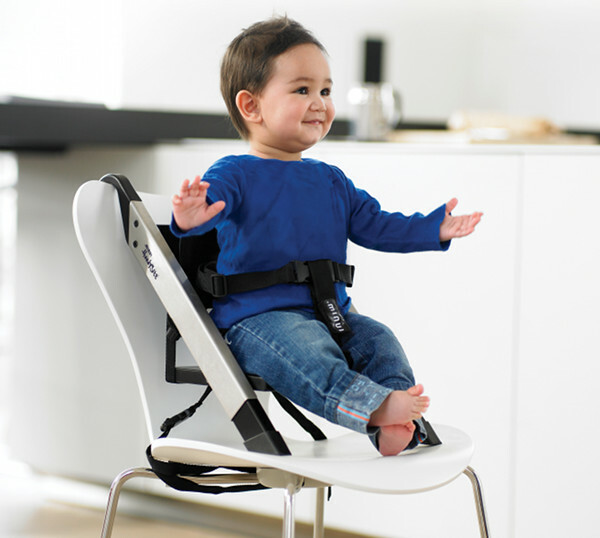 The booster seat comes with a five point harness, a three point harness and a safety bar. All are easily detached and connected so you can alter the booster to the configuration that best suits you and your child. The five point harness means the Handysitt will take your baby right from first sitting up (even if a bit wobbly!) through to toddlerdom and beyond. If you’d like to use your Handysitt seat as a play chair on the floor or outside, Minui also sells a set of optional legs which attach to the seat and allow it to stand alone. You can find the Handysitt seat in white at Haggus and Stookles for $119.95. They deliver everywhere in Australia.